School Update - What's going on? Welcome all to the latest school update. We have all been very busy in school recently producing some fantastic work and taking part in a number of different activities. We would love to share some of these with you! 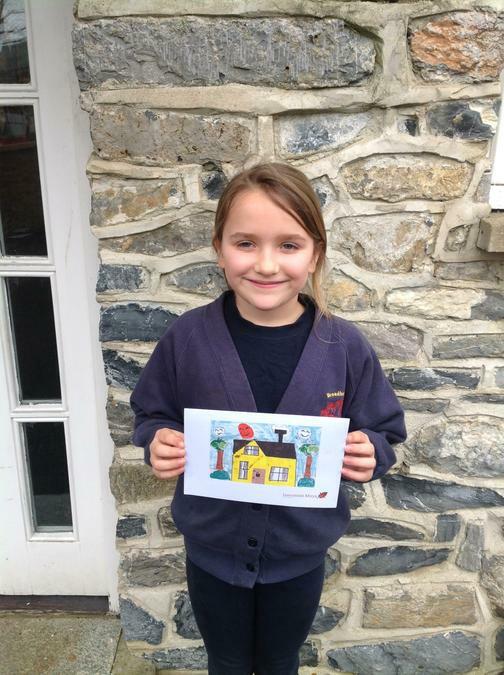 Firstly, a huge congratulations to Amie who won the Luscombe Maye competition and will now have the card she designed given to every home buyer. This is a fantastic achievement, Well Done!!!! On Thursday 7th March the school celebrated World Book Day. It was great to see everyone take part by coming in dressed as their favourite book character. We had some beautiful and wonderful costumes worn and it was obvious a lot of time had been spent creating these, so thank you all! We also ran a competition for the 'Best Dressed' in each class - well done to Arthur, Fletcher and Violet who have won their choice of a new book. The children will be selecting these this week, ready to order. 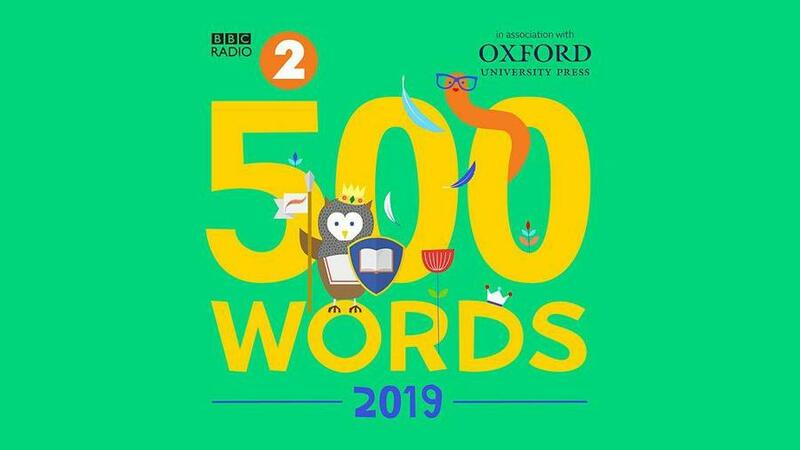 This year saw the return of Radio 2's 500 Word competition - Class 3 have created some wonderful and imaginative short stories during sessions on a Friday morning. Good Luck to the 14 children who entered the competition. On March 6th the two school Year 3/4 Handball teams went to KEVICC's to take part in a local Handball Tournament. For some of them it was the first competitive tournament they had taken part in. It was fantastic to see how the two teams worked together and built up their confidence. It was a tough competition with a lot of talent. Morale was high and the teams had a fantastic afternoon of sport with goals being scored by both teams. A big well done to Toby B for his amazing goal keeping skills! We hope to have some fun and raise money for some great causes. I have been so impressed by the uptake for Times Tables Rockstars - it has been a joy to watch children improve their multiplication tables in such a short period of time. We have introduced weekly certificates, a different one each week! It could be fastest rock speed, most coins or greatest accuracy this week? We have also developed a TT Rockstars display in the entrance of the school showing our Hall of Fame and achievements. Please encourage your children to continue to use this fantastic software as it really does help with maths confidence! Well done to the following children who have now become ROCKSTARS!!! I just want to take this opportunity to thank all of our fantastic volunteers for the time and support they give to the school and our children. The time given really does help our small school community to flourish and offer opportunities that we may not be able to offer without them. If you would like to get involved in the school and volunteer please do let Mrs Carwithen know. It is more important than ever, with the school numbers increasing, that we have volunteers to help us meet required ratios. I am currently in the final stages of developing a new behaviour policy for our school. I am hoping to launch this over the next few weeks and will send you all out a copy/place a copy on the website. Please make sure you read this policy as it details our new rewards and sanctions systems. We will also be launching an app that allows you to monitor achievements and sanctions received by your child as well as their attendance. We hope this system will allow you to get an insight into all the great things your children do here at our school. I will keep you all updated on the implementation of this new policy as soon as I can. Thank you to all of you for supporting the school with our attendance ambitions. We have set our target at 97% inline with Devon schools and are currently working towards this target. It is great to be able to reward those with 100% attendance and this was celebrated in assembly a couple of weeks ago. This weeks class winners for attendance are Class 2 with 98.6% so well done to all! On Friday 1st March we were visited by Brendan Prince who is the Founder of Above Water who came into school to talk to all of the children about keeping safe on our local beaches. It was a very informative and useful talk which gave the children a real understanding of the dangers our coastline has (and also gave them the chance to see Mr Turner have ice cold water poured down his back). Please talk to your children about being safe around water as I am sure they will have some great knowledge to pass on - I know I certainly learnt a lot. Years 1/2 and Years 5/6 had a great talk from a local firefighter about fire safety. During the talk the children learned a lot about being safe and what to do in an emergency as well as getting to try on some firefighter kit. I am currently putting together dates and activities for this years Activities Week - if you have any ideas or would like to volunteer to help with any trips that take part please let Mr Turner know. More information will follow as soon as dates are finalised. Guitar lessons start in school next Monday (18th March) an email has been sent to all parents of children who have returned slips. We hope this will give the children a greater love of music and a new skill that they can show off at some point in the near future. On Wednesday 13th March we have Makalu Kids Yoga taster sessions running during the day for all children to try this activity with the aim to setting up a new after school club. Children are not required to wear P.E. kit, however any girls wearing skirts will require leggings or shorts underneath. Swimming is going fantastically well at present with lots of the children becoming more confident and more skilled in the pool. Please remember that we have 3 sessions remaining with the last being on Tuesday 26th March. Thank you to all those that have volunteered as without you we would not have been able to offer swimming to the whole school!! Just a quick reminder that on Thursday 21st March we will be hosting our annual Celebration of Music in the Village Hall from 2.00pm you are all more than welcome to join us. Thank you to all of you who have returned your parent questionnaire which was given out at parents evening. Could any parents that have not returned their questionnaire please do so by Monday 18th March so that we can see what our development areas are for the future. If you need a new copy of the form please let Mrs Carwithen know. Thank you to all that have actioned on the letter sent out a few weeks ago regarding school uniform. The children are looking great! Could I please ask that the blue hoodies are only worn on P.E. days and for sporting events - it was not intended for day to day wearing and that trainers are not worn during the school day. We have recently seen an increase in the number of toys and the amount of jewellery being worn in school. Could I please ask for your support in this area by not allowing toys to be brought to school and to make sure that jewellery is limited to a pair of earrings. Parent Pay is now up and running in our school allowing you to pay for any lunches, trips etc online. We hope that this service is of use to you all but please let us know if you are experiencing difficulties or have any questions. As we come to the end of the first term we have lots to celebrate and remember. It has been a busy term with lots of activities happening. 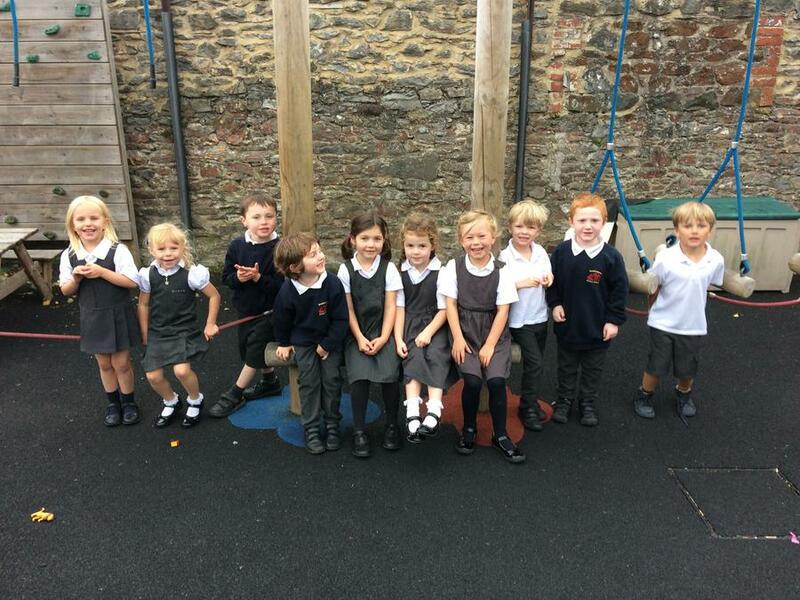 It has been great to see how all the children have settled into this academic year and how much they have learnt. In order to communicate information with our parents we use Our School App. 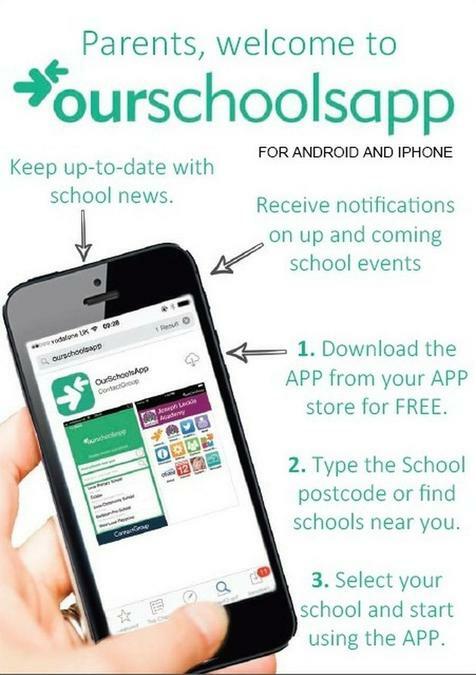 Please make sure you have downloaded the app from your app store to keep up to date with all of the events in school. Mrs Carwithen updates this on a regular basis with all necessary news, activities, informations, dates and times. This years Carol Service will be held at the church in Broadhempston at 18.30 on Tuesday 18th December. The children have been learning the carols, during assembly, for this event. Please feel free to bring your child and join us to celebrate the Christmas season. This is definitely an evening on the calendar not to be missed. With Christmas fast approaching the children and staff are busy working on the finishing touches of this years Christmas play. There will be two performances this year (dates and times in above table). We would like to extend an invite to all family members and supporters of the school. The children have worked hard for many weeks and would love for you to come and support them. It is also the time of year when I ask for so help putting up the stage on the morning of Wednesday 19th December. If your are free and able to give up an hour of your time it would be greatly appreciated. I will be in the village hall from 9am. Thank you in advance for any help you may be able to offer. Ms Steer has now completed her training fro Lego Therapy, which is a fantastic way for children to build those all important personal and social skills. In order to run these sessions we are in need of some Lego. If anyone has any Lego models, that include all the pieces and instructions, and are no longer in need of them they would be gratefully received by the school. We all had a great day out at Buckfast Abbey on Monday and got to take part in a number of different activities to celebrate the Christmas period. Thank you to all our volunteers for their help on this trip! With the last day of term fast approaching I wanted to share with you the arrangements for the day. The school day will run as normal from 8.45-15.15, however the children will be having their PTFA Christmas party from 12.00. If your child is eligible for free school meals or are in KS1 the lunch will replace their normal school dinner. If you child is in KS2 a charge of £2.70 will be in place to cover the cost of the food provided. The party will run until 14.00, at which point the children will come back to school. The children are allowed to wear their Christmas party outfit to school on this day, in order to save time changing. They can also bring in one board/card game, if they wish. After much discussion, and on the advice of the Office of the Regional Schools Commissioner, the governors voted at their last meeting to register an interest with the department for Education to move towards academy conversion with the aim of joining the LINK Multi-Academy Trust. We will start due diligence proceedings next year, which will include a consultation with parents, and we would aim to join the Trust in the academic year 2019/20. Information about the LINK MAT can be found on-line, and the details of Governors' discussion are in the minutes posted on the website. Can I take this opportunity to encourage parents to consider volunteering for the fete and village hall committees and also about standing for the Parish Council next time there is a vacancy? It would be really good to have more parents involved in these grass-roots organisations. Many thanks to all the wonderful parents and carers who have contributed so much to the school this term, volunteers, the PTFA, long-suffering makers of play costumes, homework helpers - the list goes on! It has been fantastic to welcome you all back to the school for another exciting year. 2017-2018 was a great year for the school and I envisage 2018-2019 being even better. I can't believe that we are already two and a half weeks into the year and already have so many amazing and wonderful things going on both in and out of school. May I take this opportunity to welcome all our new starters and their families to our school, it is great to see so many new faces. Everyone seems to have settled in well and be enjoying themselves. I would also like to extend a very warm welcome to Mrs Brazier who will be teaching Class 3 for three days a week. It is clear that she has had a great impact on the children already and that she has built some fantastic relationships. If you have any questions or just want a chat I know Mrs Brazier would be more than happy to. It just want to take this opportunity to thank the PTFA for all their hard work fundraising last year and the support that they have given the school. They are already busy planning events for this year and are always looking for new members, so if you have some spare time and would like to be involved please let Therese (in the office) know and she will pass on your details. The PTFA's first fund raiser is on Friday 28th September. We will be selling a selection of cakes (created by Year 3) as well as tea and coffee in the village hall from 3.20pm with all proceeds going towards our latest fundraiser. 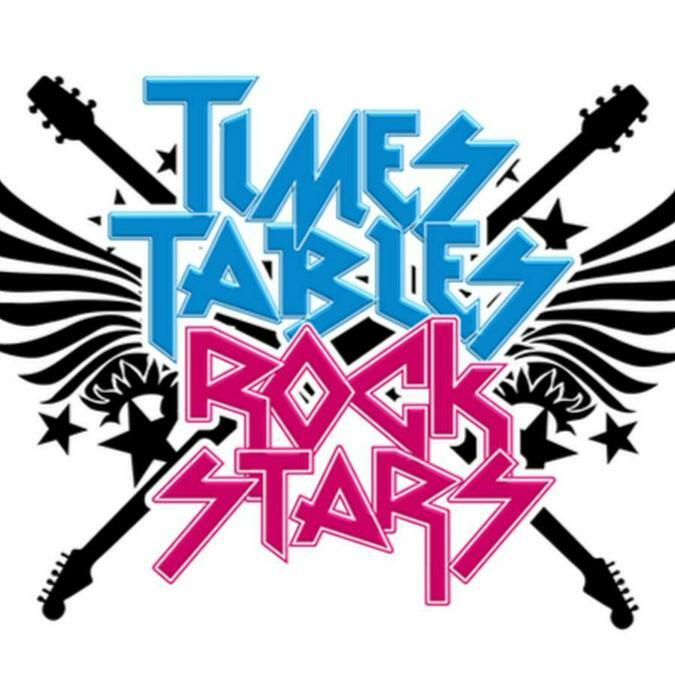 We are currently trying to raise £300 in order to purchase two new pieces of software for the school - Times Tables Rock Stars and Spelling Shed. Both of these pieces of software include materials (both paper and online) that can be used both in school and at home to enhance learning in these two key areas. A barometer has been placed in the school entrance way to show our progress towards our £300 total. A quick reminder of the routine for the start of the school day! 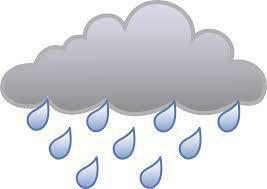 Doors to the school will be open from 8.45am for you to drop of you child/children and will remain open until 9.00am. Any arrival after 9.00am will be classified as a late mark on the register. May I thank all of you that get your children here on time so that they are ready to learn and start the day at 9.00am. Another quick piece of house keeping! If your child is ill and therefore absent from school it is imperative that you ring the school office by 9.15am. If no-one is there to answer your call please leave a message. It is important that the staff know if your child won't be in school for safeguarding reasons. With the weather now starting to cool and those rain clouds starting to rear their heads could I please ask that all parents send their children to school with rain coats just in case it is raining during break and lunch times. In order to communicate information with our parents we use Our School App. Please make sure you have downloaded the app from your app store to keep up to date with all of the events in school. Mrs Carwithen updates this on a regular basis with all necessary news and information.